Born 26 July, 1859, Viipuri. Died 16 January, 1931, Helsinki. Werner Söderhjelm was from a prosperous family of officials and merchants in Viipuri. His upbringing brought him into contact with many languages, such as Finnish, Swedish, Russian and German. Showing interest in literature at an early age, Söderhjelm would later become a literary historian. In his dissertation, he examined 18th century comedic German literature from a historical perspective. He graduated with a PhD from the Imperial Alexander University in Finland in 1885. Söderhjelm had high hopes of an academic career and to that end made study tours abroad; in particular, he broadened his philological expertise whilst visiting Germany, Denmark and France. He published numerous articles in the field of philology and worked as a German and French teacher. Based on these merits, he was granted the position of Professor extraordinarius of Romance Philology at the Imperial Alexander University in 1894. At the University, Söderhjelm vigorously promoted the teaching of ‘modern languages’, such as French, German and English, because he saw that Finnish schools needed more teachers who were qualified in those languages. This work bore fruit and Söderhjelm became the full professor of Germanic and Romance philology. Following a decision to subdivide the two branches of philology in 1908, Söderhjelm was appointed Professor of Romance Philology. A youthful infatuation with scholarly literature remained with Söderhjelm throughout his career as a philologist. He carried out biographical studies of literary figures such as Johan Ludwig Runeberg alongside his language research. His passion for literature was so strong that Söderhjelm made a bid for the professorship in aesthetics and modern literature. The post went however to Yrjö Hirn in 1910. Werner Söderhjelm’s importance as a literary researcher can be judged by the fact that the professorship of Finnish and Comparative Literature was established at the Imperial Alexander University specifically with him in mind. Söderhjelm held the post for only a few years before he was lured away by international duties. Söderhjelm had long been active in social affairs and he had good international contacts. In 1917, he became the Director of the Finnish Information office in Copenhagen. And just a couple of years later he was appointed Finnish Ambassador to Sweden. 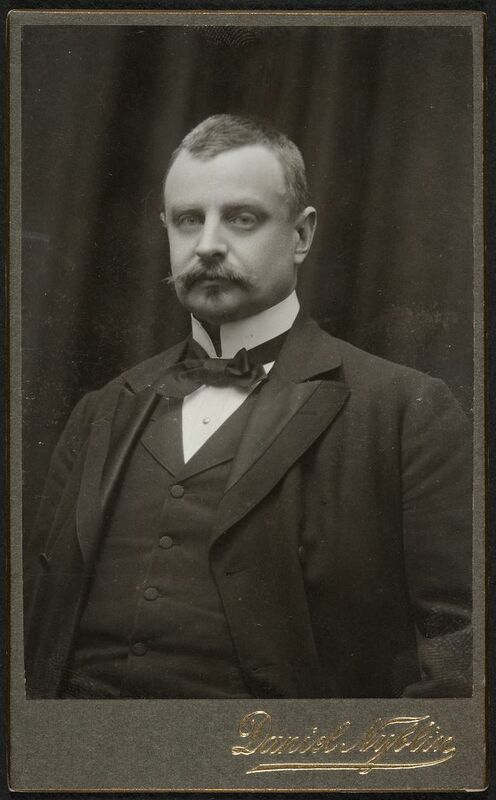 Söderhjelm’s diplomatic skills were needed to smooth the tensions between Finland and Sweden over the status of the Åland Islands in the 1920s, following the Treaty of Versailles. Werner Söderhjelm never turned his back on his scholarly calling; although he spent years in Sweden, he continued to submit research articles and essays for publication. Matti Klinge,’Söderhjelm, Werner (1859–1931)’. National Biography of Finland online, Finnish Literature Society. Accessed 6 February, 2015. University register 1853­–1899, University of Helsinki. Accessed 6 February, 2015. By Riitta-Ilona Hurmerinta. Translated by Joseph McVeigh. Revised by John Calton.